Wellesley seniors Anna Lake-Smith and Marguerite Sulmont recently won a unique Boston design contest. 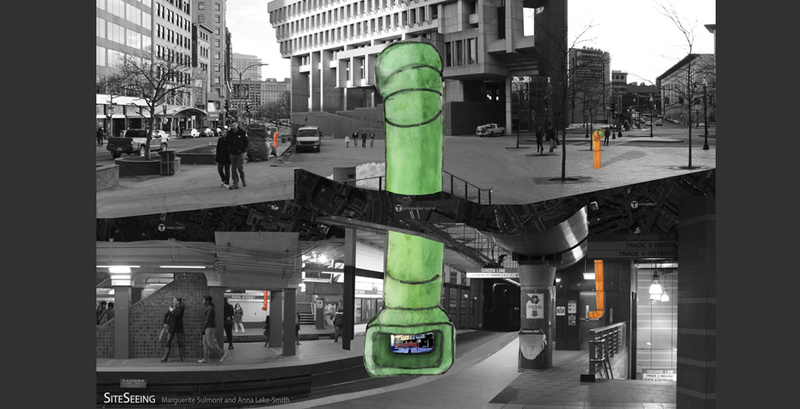 Their proposal, SiteSeeing, was one of three entries selected for top honors in the inaugural Connect Historic Boston Public Art Ideas Competition. What are the opportunities to create a memorable event or intervention that celebrates city life? Is it performative, ephemeral, temporal, or virtual? Can you imagine a Hubway (bikeshare) ballet? A light, sound, or video installation? A ferry parade? The scope is broad and far-reaching, but whatever you conjure up MUST relate to transportation, movement and place. The competition received 17 submissions from 10 different colleges and universities, including the School of the Museum of Fine Arts, the Rhode Island School of Design, and the Harvard Graduate School of Design. Three entries, including Lake-Smith and Sulmont’s entry, were chosen as winning proposals. A fourth was given an honorable mention. SiteSeeing proposes a series of periscopes to connect the subterranean and the pedestrian worlds. Each periscope provides a 360-degree panorama of the street above, and its color corresponds to the line on which it is located. One role the periscopes will fill is a tool for wayfinding, but they will take on different functions for different users. For everyone, SiteSeeing provides a new way to understand a complex, dynamic place. It allows viewers to orient themselves and become conscious of their movements within the city—both above and below ground. Martha McNamara, director of New England Arts and the Wellesley Architecture Program, and Daniela Rivera, assistant professor of art, advised Lake-Smith and Sulmont on the design, and Jordan Tynes, technology support specialist in the Art Department, helped the students stitch together the photographs used in the design board. “The design of the apparatus was playful and inviting, perfect to be placed in public spaces,” said Rivera. “Anna and Marguerite developed something that I wished existed when I was going to grad school here in Boston and I was just starting to negotiate the complexities of the Boston transportation system and the intricate city street map." Lake-Smith and Sulmont both serve on the Student Residential Experience committee as part of the Wellesley 2025 initiative. After Commencement, they will begin their architectural careers, with Sulmont in Boston and Lake-Smith in Austin, Texas. Sulmont was also recently featured in B.O.W for Sustainability, a Wellesley Stories video, viewable on the Wire. SiteSeeing, along with the other contest submissions, will be on display at the BSA Space, Boston’s leading cultural institution on architecture and design, as part of an exhibit highlighting the Connect Historic Boston Initiative during the month of June.